A good power supply has always been a component that's recommended by ourselves and those who frequent our community forum. Everyone has their personal favourites, and a brand name may arguably count for more here than on any other PC component. With the ever increasing need for power as technology development rampages onwards (especially if you're an avid overclocker or a gamer using SLI or CrossFire), then an efficient and solid power supply is an absolutely essential part to getting the most out of your system, without unnecessarily spending. 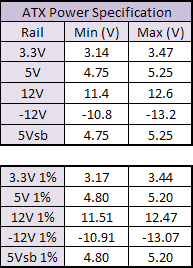 The standard (if somewhat uneducated) trick to determining if a power supply is worth having is by simply judging its weight; the heavier the better is the general consensus. However while that is true to a certain degree, other factors like adequate cooling without being too noisy, an efficient Power Factor Correction (PFC) and reliable power rails, are the fundamental differences between PSUs. 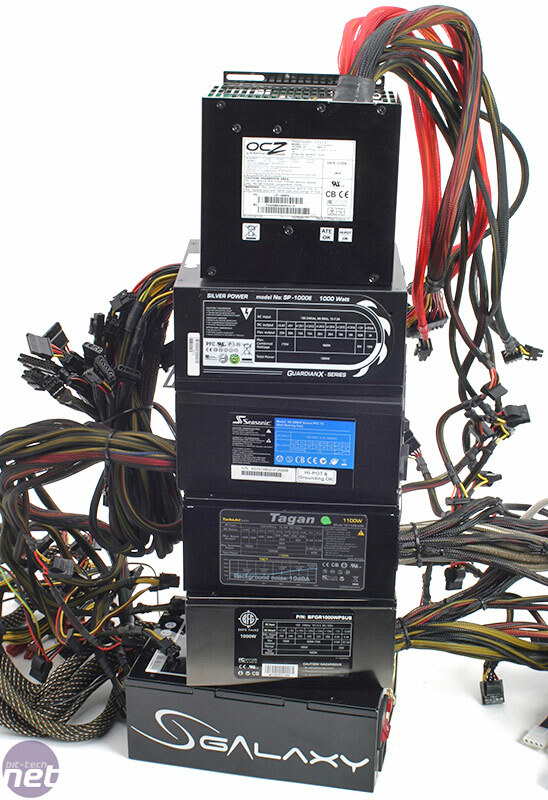 The PSUs were loaded with a specific current which applies a certain wattage to an applicable rail. The simple equation, Current (Amps) x Voltage (Volts) = Power (Watts) was used to determine this. The official ATX specification is shown just above, and if a PSU falls outside this range, no matter how quiet it sounds or what kind of special cable management it has, it fails in what it's primarily designed to do. A poor power supply can affect total system stability and reliability causing no end of headaches. If you fall in the 900W to 1100W and upwards range, we can only assume you're a user with a truly serious setup. Not one with just SLI and multiple hard drives, we mean extensive RAID and possibly optical drive arrays, multi GPU and multiprocessors (as opposed to just a multi-core) inhabit your abode. Does the average person really need a kilowatt power supply? No. Does the average enthusiast? Not necessarily either. You really have to be thinking along the lines of investing some serious cash in some serious kit and you will need something equally intensive and reliable in order to power it all safely. Don't be fooled by marketing, even with two Radeon HD 2900XTs in your system, a quad core and half a dozen hard drives you'll "only" be needing to read our 700-850W group test. The 80 plus programme is an independent certification that PSU manufacturers are now going after in order to fully ratify their product as capable of 80+ percent efficiency at 20, 50 and 100 percent loads and PFC of over 90 percent. It's an electric utility-funded incentive programme to force companies to make more efficient products as wattages spiral ever upwards, in order to save the consumer as much money as possible. Traditionally people have looked for the Energy Star rating, of which 90 percent of computers on the market currently adhere to, but this was last revised in July 2000, which is somewhere in the region of a millennia in computer years. An updated Energy Star specification (version 4.0) will go into effect from July 20th, 2007 and will include the 80 Plus programme's requirements. Some manufacturer's PSUs are already on the list, and of those reviewed today only the Enermax Galaxy DXX 1000W is currently on the list, however the site doesn't state when the list was last updated and it's hard to know which PSUs are now on or off the list. In this way when you're putting in excess of 1kW through your system, even a small increase in efficiency can save quite a considerable amount of money in the long term.